Thanks to ZenPhoria on Flickr for the link. 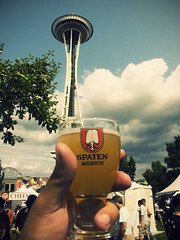 Seattle has quite a few beer festivals throughout the year, but this weekend’s Seattle International Beer Festival (SIB) is one of my favorites. Most beer festivals focus exclusively on draft beer, often from local and regional breweries. But, the goal of SIB is to bring in great beers from around the world, both on draft and in bottles, as well as treats from around the region. It is definitely a beer geek’s festival. To top it off, it looks like the weather will be beautiful every day of the event. This year’s festival features more than 200 world-class beers from 16 countries. About half of the beers are on draft and many can be had for just a single ticket. Much of what they have available in bottles are expensive beers that might cost you upwards of $15/bottle to buy in a store. These might cost you more than a single ticket, but it is a great chance to try these beers without having to buy the entire bottle. During prime days/hours the festival has been known to get a little packed in the past, but this year the fest moves to the larger Fisher Pavilion and Lawn. Still located under the Space Needle at Seattle Center, but with twice the space as before and indoor restrooms. I’m not sure that will make lines shorter, but hopefully you’ll be able to spread out a bit. The full beer list can be found here, and I’ve called out a few suggestions on what to target below. Many of the beers available have a very high alcohol content, so please drink responsibly and don’t drive. The Fisher Pavilion and Lawn at Seattle Center. $25 in advance for any day, or $30 at the gate for Friday and Sunday; $35 at the gate for Saturday. Entry includes a tasting glass and 10 beer tickets. All beer samples are 4oz servings and cost 1 to 7 tickets, depending on the what it cost the organizers to buy the particular beer. Extra tickets are available for $1 each. The event is 21+ only. There will be food on-site and bands throughout the weekend. As for most festivals, it could get busy and I’d suggest going early. Hopworks Ace of Spades Imperial IPA – One of the northwest’s best imperial IPAs. Pretty sure a fresh batch just came out very recently. Fremont Barrel-Aged Abominable (B-Bomb) – Fremont makes a lot of great beers, but this one might be the most impressive. Complex and robust without being too over the top. Bateman’s Mocha Beer – First of all, I love coffee beers. Second of all, I’m not sure this particular beer from the English brewery has ever been available before in the US. Southampton Beers – I don’t believe any beers from the well-respected Southampton Brewery in New York have ever previously been available in Seattle. They’ll have the Abbot 12 Quad, Cuvee des Fleurs Saison, Grand Cru Strong Ale, and Imperial Porter. Of those, I think I’ve only sampled the Abbot 12. It’s fantastic. Deschutes/Hair of the Dog Conflux No. 1 – Collage – A new collaboration from Portland’s Hair of the Dog Brewing and Bend’s Deschutes Brewing. Silver City Ziggy Zoggy – If you are looking for something a little more sessionable, this unfiltered, hoppy lager is perfect. Evil Twin Monk Suffers Serious Sugar Rush on Barbados – I’ve never tasted this dark Belgian Strong Ale infused with muscovado sugar, but I love the name. Best beer festival I’ve ever been to. Amazing selection of beers,great values for your tickets, and good snacks and food options. And, you can go multiple days. hmmm…i thought you might mention sam adams utopias. i’m hoping to get a taste of that (i don’t think i’ve ever said that about a sa beer before). I LOVED the new space. The grounds were cleaner, there was more grass, more seating, more food choices, and more beer. There was a great deal more room so it never felt crowded, which was so much better than previous years. And having access to real bathrooms and real sinks was wonderful. One of the best things was the cigar vendor was up on a little hill, instead of the middle of the grounds, so it was only unpleasant when the wind blew the wrong way. But overall, this year’s festival was phenomenally better. Can’t wait until SIBF 2013. I tried the Ziggy Zoggy and it tasted exactly..like Pabst. Do not recommend.